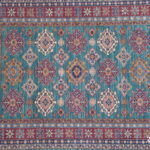 Kazak carpets are mainly woven by the people of Afghanistan and are influenced by the C Caucasian designs found in the old rugs from Russia and of those rugs found in the northern parts of the Persian empire, Typically geometric in pattern Kazaks are of different beautiful colors such as red ,yellow, gold and blue colors. 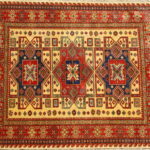 Designs can include animals and flowers and medallions similar to tribal rugs but are almost and always implemented with straight lines. These carpets also made by Afghanistan people in 1990s for the first time. And due to their magnificent and desirable colors and high quality woolen yarn used in these types of carpets it has a standard name in international markets.